This flat, In the heart of a peaceful fisher and farmer village people, walk distance of 15 minutes from the beach! A +/- 20Km of white silky sand beaches,lots of birds, our house offers the smelly Mediterranean plants and the peaceful and quiet sight of a starred sky,magnificent sunsets in a large alfresco patio after a very warm sunny day! Our swimming pool, disinfected by salt system, invites you, even in the hot nights,to have a swim under the stars! Hot water by solar energy. We are surrounded by some of the best Golf courses and 5km from the best of Europe! Manta Rota grew between farms and the sea. Without really being a fishing village, Manta Rota can keep afford fresh vegetables and always very fresh fish! Surrounded by Castles museums and legends of Moors, a cultural richness, legacy, we are neighboring cities-museums as Mértola, Beja or even Sevilha, in Spain: 1 h 30 from Beja and from Seville. Manta Rota has a privileged situation between civilizations and Cultures. An hour and a half between Manta Rota in a circle that goes from the West coast of Sagres, to Sevilha, Beja and Mértola, in the Alentejo: its museums, its Culture, its Art, its songs, hunting areas, excellent wines and the beauty of one unique landscape in the world! The Natural Legacy: Manta Rota is located between 2 natural parks: Ria Formosa, which begins here and ends after the city fishing port Olhão. The Sapal, Salt works, which houses a variety of animals and water birds, such as the pink flamingos. Above all: We have the more important and priceless MUST: Peace! Although the owner lives on the ground floor, the privacy of guests is highly preserved ... and allows the claims on the field! We spent four days at Maria's apartment which is the top floor of a villa. The apartment is spacious and very clean and comfortable. The outdoor space is wonderful with the pool and gardens being the best feature. There is plenty of seating and little cozy areas to escape to. We could not believe we were close to other houses and hardly heard a sound - it was so peaceful!! Manta Rota itself was very clean and has a handful of bars and restaurants. Many a cocktail was sampled. The beach is vast so finding a quiet spot was easy. I would have no hesitation in recommending this apartment to anyone and would gladly return. Lovely peaceful garden and pool. Senhora Dias was very friendly and welcoming as was her family. Thoroughly enjoyed our stay and privacy was excellent. We enjoyed our conversations with the Dias family who were very welcoming. 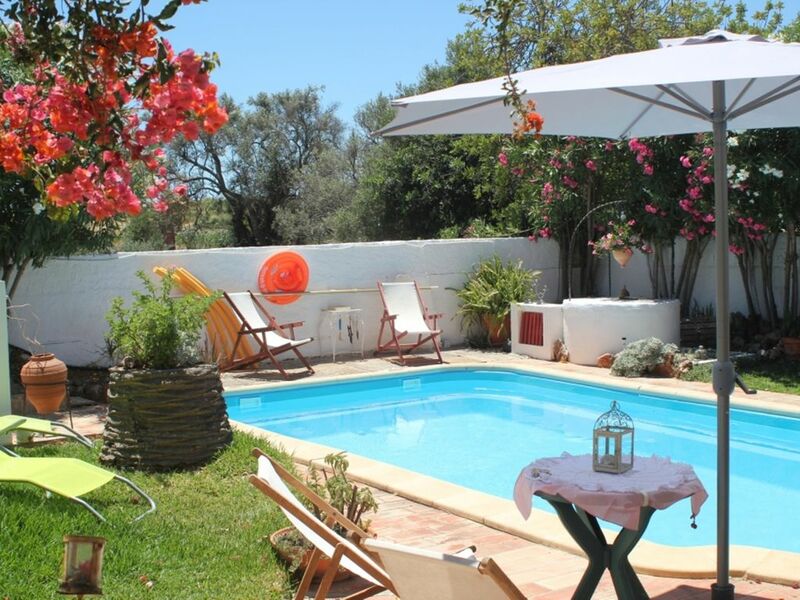 Amazing sun terrace, fabulous pool & wonderful hosts! Maria José & her daughter maintain a beautiful place to stay & they are extremely respectful of privacy and the place they offer is such a gem! The terrace gets plentiful sun & the pool is salt water & cools you down in the lunchtime sun! The generosity of these hosts was lovely & appreciated and the apartment was stocked with all the essentials we required. The restaurants & places nearby offered delicious authentic Portuguese food. We had a wonderful time! Recevoir ces clients-ci, a été pour moi, recevoir la Famille. Ils ont été au petits soins pour moi! Ça oui! En résumé: Nous sommes allés bien, bien au-delà du vulgaire Tourisme! Comme ça tout vaut la peine! Qualités : Dialogants! Gentillesse! Sympathie! Correction totale! Excellent accueil et contacts chaleureux avec la propriétaire (multilingue). Appartement vaste en 1er étage de la maison et parfaitement bien équipé. Idéalement placé pour accéder à la plage ou pour se promener en campagne. Belle piscine disponible dans le jardin mais que nous n'avons pas utilisée. A tester à nouveau lors d'une période différente (printemps par exemple). By car,or train!Vila Nova de Cacela have a train station!Call me and I get you! We live between 2 Natural Parks: Ria Formosa ,which ends/begins at MR beach,and The Sapal,Castro Marim,near VRSAntonio where any one can observe any kind of wild birds nesting,flying or swimming,such as Flamingos,wild ducks.In Autumn/Winter,come and observe migration birds, only existing here for now!Try and byke there around The sunset...ENJOY!! You have also Golf.And all the tasteful Cuisine of the Algarve mountains,the Bread museum...and Tavira for Art and Galeries,or dive into our regional fairies!!!!! tarif en fonction du nombre de personnes, acompte/arrhes à la réservation, remise des clés par le propriétaire. EN HIVER du20 Octobre jusqu'au 31 Mars, la location par mois le prix marqué L'ELECTRICITÉ EST PAYÉ PAR LE CLIENT, l'eau et le Gaz sont compris dans le tarif! EN HIVER les prix sont établis pour 2 personnes! Un SURPLUS DEVRA ÊTRE PAYÉ Quand le couple reçoit des invités au-delà de 1 semaine ou plus: 15% du prix/jour fixé sur le site. IN WINTER from the 20th October until the 31st March, the price per month, doesn't include ELECTRIC IS PAYED BY THE CLIENT, the WATER and GAS ARE include ON the price. IN WINTER prices are established for 2 persons. An EXTRA shall be payed if friends are received for more than 1 week: 15% of the price per day fixed on the site.